Happy Friday the 13th. I am reposting my origins of Friday the 13th post to help celebrate this wonderful day. I hope your 13th is as luck as mine has been! 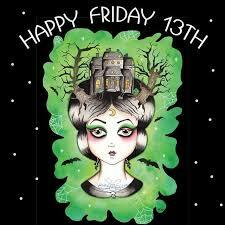 Friday the 13th is considered the most unlucky day of the year. Most people aren't entirely sure where this bad luck comes from, but fear of Friday the 13th can affect as many as 1 in 4 people. The fear of Friday the 13th is known as triskaidekaphobia. It is clear there are many reasons to fear the dreaded Friday the 13th, but for me Friday the 13ths have always been lucky. So have a happy Friday the 13th, watch one of the 12 million Friday the 13th movies (I like the one in space), and wish me luck on my lucky day. I guess when you're dealing with the significance of a number, there are always multiple ways to interpret it. Everything gets counted so anything can add up to 13. Happy Friday the 13th! Since as a kid, I always been told how unlucky these day and just remain in bed. Today if its true or not about Friday the 13th I refuse to break tradition and sleep a few hours more.